If you need an emergency dentist, we will see you today, if possible. Give us a call at (630) 717-9499. We are available to help during office hours, which include early morning hours three days a week (see below). 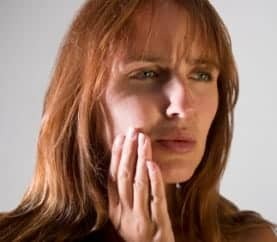 If you have a toothache, we will focus on getting you out of pain today, and then we will discuss your options for a more long-term solution to your problems. During office hours, if you are hurting, please call now. We want to see you today and get you out of pain! Call (630) 717-9499. If you are a patient of record, we can see you during office hours and sometimes after office hours. Outside of regular office hours, please call Edward Hospital or simply visit their emergency room at 801 S. Washington, Naperville, IL 60540. For current wait times, which are often under five minutes, call Edward Hospital at (630) 527-5969. Many people who call with a dental emergency have a fear of the dentist. We understand. Dr. Newkirk is experienced in handling your problems. This fear often comes from the way you were treated in a previous office. We will not try to embarrass you about your problem. And if you have anxieties, we can help. Dr. Newkirk is trained in sedation dentistry, and he can use nitrous oxide sedation or oral conscious sedation, as your case may require. A toothache usually comes from a tooth infection, and the cause is usually decay. 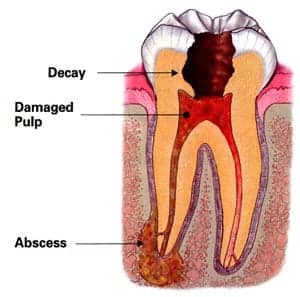 When decay reaches the pulp of the tooth, the decay bacteria infect the pulp. Since the pulp is in a confined space, it can’t swell to accommodate white blood cells to fight off the infection. As it tries to swell, it often causes severe pain. If the infection isn’t eliminated, the pulp tissue inside the tooth dies, and the pain goes away. Some people think that the problem has then gone away, but it just spreads. Eventually the infection spills out into the bone, as is shown in the diagram above, and causes an abscess. An abscess usually isn’t painful right away. It may just be a mild discomfort to chewing. Sometimes people notice a small pimple on the gum where the abscess is trying to drain. If not treated, the infection continues to spread. If it goes far enough, it can become life-threatening. Depending on the location, it can close off your airway, or even spread to the brain. It’s definitely not something you should trifle with. Call Dr. Newkirk at (630) 717-9499.